For me, a baked apple is a cross between apple streusel and apple pie. Succulent, highly fragrant, sweet, and completely focused on the apple. Cinnamon, nutmeg, allspice, cloves… all things perfect with apples. What makes mine different than others? I incorporate a buttery crumbly struesel stuffing in the cavity where the core was. 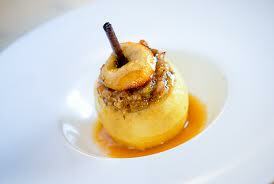 When roasted, the juice from the apple mixes with the filling, and the sweet buttery filling mixes with the apple. It’s absolutely delicious. Add a few walnuts and you have the perfect dessert. I also bake the apples with a little bit of cider to add extra flavor and a moist cooking method at the base. Your choice of apples is easy. Local apples, grown for baking are best. McIntosh, jonamac, rome, and so on are best. Stay away from very crunchy or excessively tart apples. Would want something with higher sugar content, and keep the apples small. They cook faster and minimize the ‘rubbery’ texture overcooking will do to the skin. This recipe is perfect for any dinner party, gathering, or just to have. You can prepare these a day in advance, they only take a few minutes each, and will leave everyone feeling good! Mix the sugar, flour, dry spices, water and softened butter together until crumbly. Gently work in the walnuts. Let cool slightly in the fridge. Heat an oven to 350. Using an apple corer, remove the core from the apples. Gently pierce the inside of each apple with a pairing knife multiple times. This lets the juice run into the middle, and seasoning to permeate into the apple. Rub the inside of each with lemon, slightly squeezing to lightly coat with juice. Tightly pack the middle of each apple with the filling. Place them on a greased baking sheet and top each one with 1 tsp of the reserved butter. Pour the cider in the pan around the apples. Roast until soft in the middle and lightly browned on top, about 45 minutes. Let cool slightly and serve right away. Of course this is best with vanilla French style ice cream.